The Kurdistan Regional Government notes the updates by DNO and Genel Energy on November 1st regarding production increases under the Tawke Production Sharing Contract (PSC). The KRG is pleased with the efforts of the Tawke PSC Contractors in the Peshkabir area of the Tawke PSC Licence, where production has risen to over 50,000 barrels per day (bpd) within 18 months, exceeding expectations. 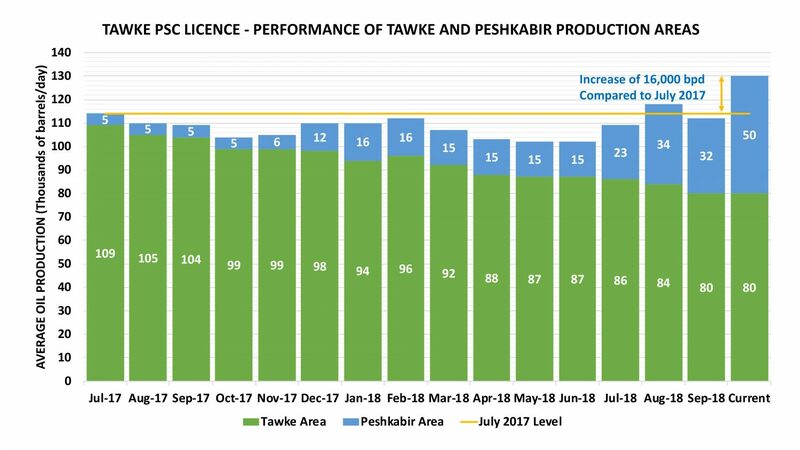 The recent boost in production at the Peshkabir area has more than compensated for the natural decline of the main Tawke field area, where production is now down to about 80,000 bpd, from 109,000 bpd in July 2017. Overall production under the Tawke PSC Licence reached 126,000 during October, compared to 114,000 bpd in July 2017. The current average is around 130,000 bpd (click here to view the chart). The KRG currently exports over 400,000 bpd of crude oil. The KRG’s policy of maintaining consistent and timely payments to its producing oil companies has led to more investment in its oil fields, stabilising production levels and paving the way for further production increases during 2019. Posted in Business, Citi, Citigroup, DNO, featured, Genel Energy, Iraq Oil & Gas News, Iraq Oil Production News, KRG, Kurdistan News, Tawke. DNO ASA, the Norwegian oil and gas operator, today announced plans for its first dividend distribution to shareholders in 13 years following release of strong half-year 2018 results, including revenues of USD 289 million which were up 83 percent from the same period last year. The Company also reported a net profit of USD 61 million and free cash flow of USD 142 million during the first half of the year. “With growing production and robust and reliable revenues, the dividend announcement underscores confidence in our strong growth prospects,” said DNO’s Executive Chairman Bijan Mossavar-Rahmani (pictured). “Kurdistan is back and so is DNO,” he added. The Company continues to ramp up activity in the Kurdistan region of Iraq, where fast track development of the Peshkabir field is expected to boost output by another 15,000 barrels of oil per day (bopd) to 50,000 bopd by yearend. The Company, the most active driller in Kurdistan, has three rigs operating across its licenses with a fourth to be added next month. Two rigs will be active at the flagship Tawke field to reverse natural field decline through workovers and the drilling of two wells in the main Cretaceous reservoir and two wells in the shallow Jeribe reservoir. Operations will commence at the Baeshiqa license with another rig to be mobilized to spud the first well in September as part of a back-to-back, three-well exploration program. DNO acquired a 32 percent interest in and operatorship of the Baeshiqa license last year, joining ExxonMobil (32 percent), the Turkish Energy Company (16 percent) and the Kurdistan Regional Government (20 percent). At Peshkabir, the fourth rig will spud Peshkabir-8 in 10 days followed by Peshkabir-9 in October. Early production and successful appraisal have raised previous field proven (1P) and proven and probable (2P) reserves. Two newly completed wells, Peshkabir-6 and Peshkabir-7, will commence testing by the end of this month before being placed on production. Peshkabir-6 is key to unlocking further Cretaceous and Triassic reserves. “Peshkabir is proving prolific in production and has generated over USD 300 million in gross revenue since startup last year or three times the investment,” said Mr. Mossavar-Rahmani. Elsewhere, DNO recently completed the sale of its Tunisia assets and relinquished Block SL18 in Somaliland as part of the Company’s ongoing rationalization of its portfolio through divestment of non-core assets and focus on expanding operations in Kurdistan and Norway. Offshore Norway, the Company recently added six new exploration licenses for a total of 21 licenses and plans to participate in one exploration well in the fall, followed by at least five wells next year. DNO retains indirect interests in North Sea assets through its 28.23 percent strategic stake in Faroe Petroleum plc and, given the size of its shareholding, will request seats on the board and has asked for an extraordinary general meeting to be called for this purpose. DNO exited the second quarter with a cash balance of USD 584 million in addition to USD 288 million in marketable securities and treasury shares. The Company’s outstanding bond debt stands at USD 600 million. The planned annual dividend distribution of NOK 434 million (USD 50 million equivalent), payable in two tranches, is subject to shareholder approval. To facilitate the distribution of the planned dividend, the DNO Board of Directors will convene an extraordinary general meeting on 13 September 2018 (i) to seek approval for payment of a dividend of NOK 0.2 per share in H2 2018 to be distributed to shareholders of record on 13 September 2018 (as registered in the VPS on 17 September 2018), and (ii) to seek authorization to approve an additional dividend payment of NOK 0.2 per share in H1 2019. Posted in Baeshiqa, Dinar, Dinar Daddy, Dinar Guru, Dinar Recaps, Dinar Vets, DNO, ExxonMobil, featured, Genel Energy, Iraq Oil & Gas News, Kurdistan News, Norway, Peshkabir, Tawke. DNO ASA, the Norwegian oil and gas operator, today announced a two-thirds increase in production from the Peshkabir field in the Tawke license in the Kurdistan region of Iraq to 25,000 barrels of oil per day (bopd) following completion of the Peshkabir-4 well testing program. The well has been placed on production at a rate of 10,000 bopd through a 72/64″ choke with 790 psi wellhead pressure through temporary, capacity-constrained test facilities and the oil trucked to Fish Khabur for export. The Peshkabir-4 well was designed as a high angle well to assess the central part of the structure four kilometers west of the Peshkabir-3 well and drilled to a measured depth of 3,525 meters, including a 1,150 meter extended reach reservoir section. A total of 11 zones were tested and flowed between 1,500 bopd and 7,000 bopd per zone. The next well in the 2018 field development campaign, Peshkabir-5, has been drilled seven kilometers west of Peshkabir-3 and has successfully proved the westward extension of the field. Completed in June, it is currently undergoing final testing; a total of four zones have been tested so far and flowed between 4,000 bopd and 7,500 bopd per zone. DNO will bring this well onstream in August and expects to reach and surpass its previously announced summer 2018 Peshkabir production target of 30,000 bopd. “The pickup in Peshkabir production puts new meaning to the fast in fast track in development of this field by the DNO team,” said Bijan Mossavar-Rahmani, DNO’s Executive Chairman. “And we expect Peshkabir to continue to surprise to the upside,” he added. Two other wells, Peshkabir-6 and Peshkabir-7, are drilling ahead at 3,900 meters and 3,100 meters, respectively. Peshkabir-6, a near vertical well, will explore the field’s deeper Triassic formation and establish the Cretaceous oil/water contact level. Peshkabir-7 is a high angle producer well located between Peshkabir-4 and Peshkabir-5. The Peshkabir field was brought on production in 2017 and two drilled wells last year, Peshkabir-2 and Peshkabir-3, have produced at a constant combined rate of around 15,000 bopd. DNO operates and has a 75 percent interest in the Tawke license, which contains the Tawke and Peshkabir fields, with partner Genel Energy plc holding the remainder. Together, output from the two fields has averaged 106,000 bopd year-to-date. Posted in DNO, featured, Genel Energy, Iraq Oil & Gas News, Iraq Oil Production News, Kurdistan News, Norway, Peshkabir, Tawke.